The P&P95Forever Club: Game the Twenty-Fourth: Which Minor P&P Character Are You? Game the Twenty-Fourth: Which Minor P&P Character Are You? It is Miss Dashwood's turn to post a new game this week, but like Lady Bertram she feels quite stupid tonight, and is copping out by sharing a fun personality quiz with the forgiving members of the Club. Which minor P&P character are you? 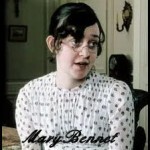 Miss Dashwood, who is fond of writing in the third person from time to time, is Mary Bennet. Miss Marianne is Kitty Bennet, which makes them sisters, which is pleasant. The fact that they are Mary and Kitty is less desirable. Who are you? Tell us in the comments! Yikes! I am Caroline Bingley. I'm Kitty Bennet! I was sure I'd be Charlotte Lucas. In fact, I can tell you now that I'm much more like Charlotte than Kitty!! Finally! A game I can do :) Though I have watched the movie a couple of times and read the book once, I don't really have the knowledge to take part in many of the games, not without embarrassing myself anyway :(. Apparently, I am Caroline Bingley. Which I totally disagree with... but there must be a not so nice side to me somewhere...sighs. I thought I would have been a mixture of Mary and Charlotte. And I must say that I really enjoy your blog!! I got Charlotte Lucas Collins. And I'm not sure I know how to interpret this... I know I'd rather be an old maid than marry someone I didn't love!